As you'd expect from Scotland's stylish, historic Edinburgh, the airport hotels include Marriott, Travelodge and Holiday Inn and offer friendly, efficient service, fabulous facilities and, of course, delicious dining. If you want to book an Edinburgh Airport hotel then we definately can help by delivering the best hotels in an easy to read format with full details on each and every one. 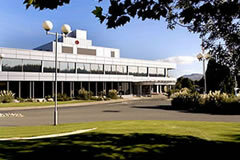 We bring you the best deals – We have a huge selection of Edinburgh Airport hotels for you to choose from. You are bound to find the ideal one for your requirements. Book everything in one place – Looking for an Edinburgh Airport hotel with parking? No problem. Book everything together with UKACP. Make huge savings – We love a bargain! That’s why we have brought you some of the best prices you will find on the web. Plenty of information – You will find everything you need to know about all hotels on our website. We even have walkthrough videos for some of the hotels featured on site. Quick and easy – Found a hotel you like? 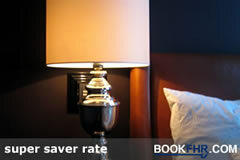 All you need to do is click on ‘book now’ to do exactly that. The process is really fast and easy. We will send you a confirmation. Print it out and take it with you. Get pampered before your vacation at The Hilton Edinburgh. This airport hotel has a stylish salon, which means you can look your best before boarding your flight. There are also swimming and gym facilities plus an excellent array of superb restaurants offering seasonal menus. Rooms have 32" flat screen TVs with pay per view channels, climate control, desk and lamp, arm chairs and free drinks pls a coffee machine. Quality Hotel is a popular choice amongst families. This hotel is renowned for their high levels of customer service and has won awards for this very reason. If you leave without breakfast they will give you some packed goodies for the journey. Good news for hungry kids! 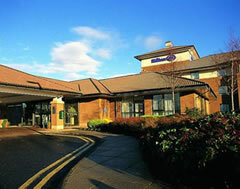 Another popular example of a great family hotel at this airport is the four-star Edinburgh Marriott Hotel. 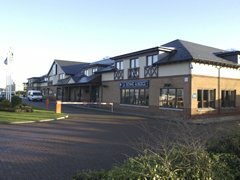 The Queensferry Hotel is an exceptional hotel for disabled customers. It has wheelchair accessible bedrooms, with plenty of lifts and walk-in showers. The hotel also has a transfer bus service, which runs every five to ten minutes. Other convenient options include Holiday Inn Express Edinburgh Airport and Hilton Hotel, both of which run a regular bus service to the airport. Don't forget that if you decide not to stay in a hotel the night before you fly you can still save money on our Edinburgh airport parking packages. We will always save you anything from 15 to 60% compared to the car park gate price.